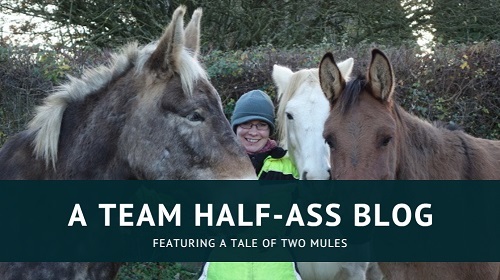 This month, the #HorseBloggers group on Facebook set a blogging theme that required us to share our top training tip (later amended to any kind of top tip). I did consider doing a nonsense response (for example, my current top tip for easily removing one mule from the yard without the other “I love running off down the lanes on exciting solo adventures because the Pied Piper told me to” mule coming with you, is to fling a pre-filled treat ball in the other direction like a big plastic grenade) … but then I decided I would use this opportunity to be vaguely serious instead. Every time you interact with your mule, you are training them. The following thoughts apply to everything you do with your mule, whether you’re working them in the arena or leading them back to the field. Consistency is key and training isn’t just something that happens under saddle! As always: I am not a professional trainer, I am not trying to present myself as a professional trainer, I don’t always get it right, I just want to share some things I’ve learned that have helped me the most. Many thanks to Ben (who does know what he’s talking about) who supplied the exercises. Marty being led by our friend Robyn, showing the ‘smile’ in the line. Robyn is asking for him to follow the feel and come forward a little but, as you can see, she only needs to lift the rope with a finger. 1. When you pick up a rein, it needs to mean something. This goes for leading them from the ground, too. You want your mule to respond to the most subtle change in the weight of a rein or leadrope – I’m talking about the difference between a closed index finger and a relaxed one, or the angle of your wrist. If you are constantly exerting pressure, then you will have to exert more pressure to get the desired result. This becomes a vicious circle as the mule learns to tune out the pressure in their mouth or on their nose, because it is meaningless to them. It’s the same reason why you don’t want to get a stronger bit to deal with a strong horse: the stronger bit will work for a while, but if you aren’t addressing the root cause, then eventually the horse will match its strength, you’ll have to move on to a stronger bit, and so on. Don’t pull on them and they won’t pull on you. 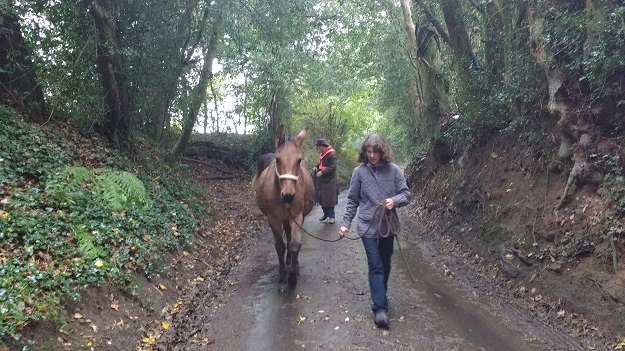 “Walk along at your mule’s shoulder with the lead rope in your hand (held like a rein, with your thumb up and the lead to the mule running from the bottom of your hand) and the rope hanging with a ‘smile’ in it between you and your mule. Pick up the rope towards your opposite shoulder, turning your hand so your little finger is pointed at your shoulder. 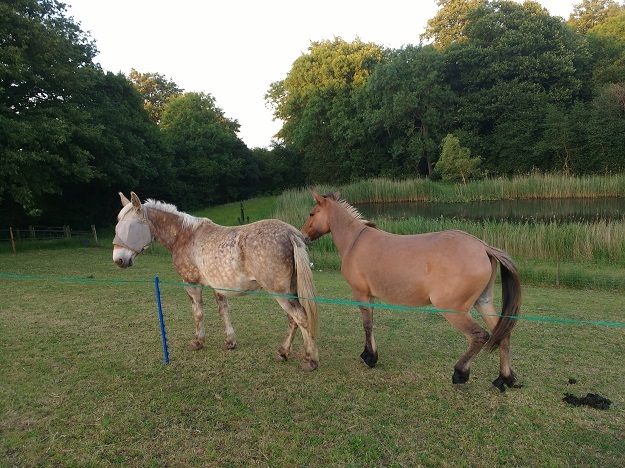 Before the rope gets tight your mule should bend their head and start stepping their hind feet out and away from you, so they come to a stop facing you. If they don’t, you need to do some work on getting them following a feel on the lead rope. Here, Marty had been following Xato around the track when Xato decided to stop – for Xato reasons. Marty was irritated and tossed his head, pinned his ears, and stamped his own feet, but nothing was going to make Xato move out of the way. He had complete control over the situation. 2. Don’t let them move your feet. I’m almost hesitant to write this one, because it is a phrase which is often hijacked and misinterpreted; people associate it with other buzzwords such as respect and leadership, and aren’t willing to look further. So, hear me out for a minute. First of all, being a leader is not the same thing as being a domineering, my-way-or-the-highway bully, and in fact mules really, really need to know that you are capable of handling a situation and looking out for their welfare while also listening to what they have to say. It’s not a case of being the ‘dominant alpha’ or any of that nonsense, it’s about showing your mule that you are competent, that they can rely on you, and that they don’t have to make all the decisions. Mules have more independence than horses so if they don’t think you have their best interests at heart, they’re not going to stick around. Secondly, not allowing your mule to crowd you and push you about not only makes them feel better, but it keeps you safe. That is really important. You can’t get your mule out of trouble if they’ve run you over. 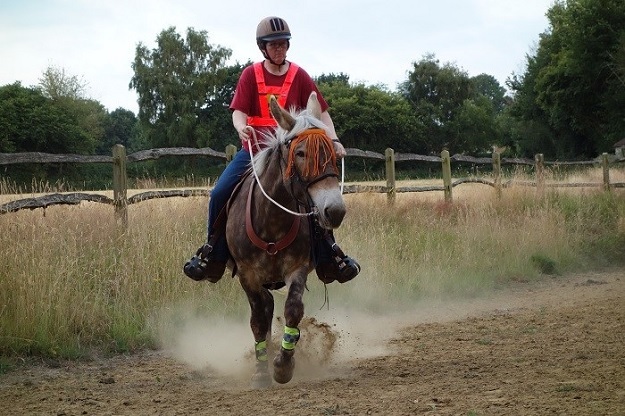 People say that no amount of training will stop an equine from running you down when afraid, but we have not found that to be entirely true – always err on the side of caution and never put yourself in a bad position if you can avoid it, but we have had a couple of situations where the herd has been spooked by an external stimulus and bolted, without so much as bumping us. They don’t crash into each other, so why should we be any different? It might be worth getting someone to watch or film you while you’re doing groundwork, as it’s very easy to step back out of their space without realising that you’re doing it. I used to do it a lot and occasionally still catch myself doing it. “Stand facing your mule from a few steps away – about four to six feet is fine – then ask them to step back by squaring your shoulders, standing taller, breathing in and starting to step towards them with the manner you would use if you needed to get across a crowded railway platform to catch a train. If your mule steps back, take off all the pressure and make a fuss of them. If they don’t you might have to jump up and down and do a bit of interpretive dance until they decide you are too weird and step back; the moment their feet move, you quit. After a couple of tries you’ll find that they start to step back when you begin to square up and get tall. Ben helping Xato exit at speed. 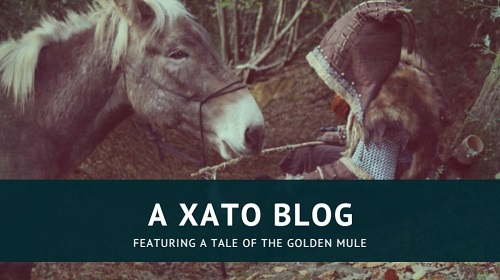 Xato is very reluctant to go most of the time – a symptom of a lack of confidence – so this is a very useful exercise for him. 3. Help them get away. I wrote about this in a little more depth here, under “Go with the mule so the mule can go with you” in the conclusion to my Joe Wolter clinic write-up, and in a more roundabout way here, in part one of Marty’s visit to Anna Bonnage. I am still having to train myself to overcome instinct and years of muscle memory, but the gist of it is: you want the mule to know they can leave. Sounds counter-intuitive, right? But a mule who knows that they can remove themselves from a scary situation is much safer – and much less likely to leave – than a mule who feels constricted. Mules, by nature, are more likely to freeze when confronted with something that worries them, but there is a difference between the freeze that happens while they consider the threat and the freeze that happens because they think they have no other option. By helping them get away from a threat – turning their idea in your idea – you are confirming your ability to look out for them. “Does your mule have a ‘scary’ side of the arena? If not, you can often create one by leaving a coat on the rail or otherwise changing the environment. Start at the other end of the arena and ride towards it (this can be done on the ground but is easier ridden, because it gives you the opportunity to turn both ways. If you’re working on the ground, get the previous two exercises good first!) until you feel a bit of hesitance in your mule. This is the threshold of them getting concerned. Then, simply allow them to turn back to the other end of the arena – if they make the turn themselves it’s fine – and trot a circle or two before coming back towards the worrying bit. When they are heading towards it there is no hurry, but when they turn away, you can ask them to walk faster or trot and then keep them trotting a little at the safe end of the arena before walking out again. If you have trouble getting your mule into trot, then this is a great way to work on it by taking their inclination to hurry from from the object and turning it into your idea to trot. 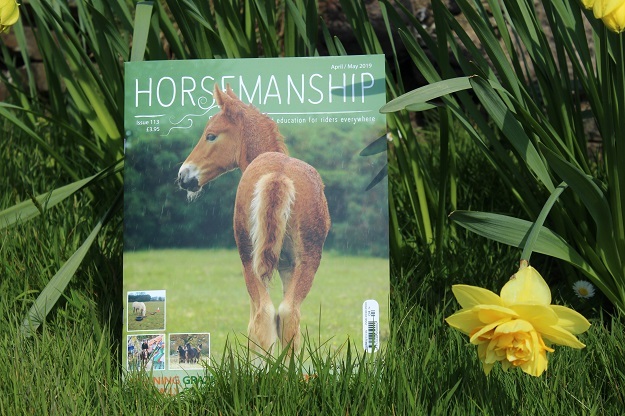 If you enjoyed this post, perhaps I could point you in the direction of Horsemanship Magazine? The many roads from me to Xato.